Shares finished the day up 2.14% to $37.67 after beginning trading as low as $35.28. Reports of the death of cyclical technology stocks are premature, apparently. The narrowing of spreads on Treasury notes remains a matter of concern, as we also look at Coupa Software. Company reaction to cloud market shifts are key in the company's turnaround narrative. Hewlett Packard Enterprises results are not convincing enough. Cash flow pledge seen as achievable despite costly programs to re-positioning business. If estimates continue to come up there will be institutional interest in the stock. Let's focus on the charts and indicators. 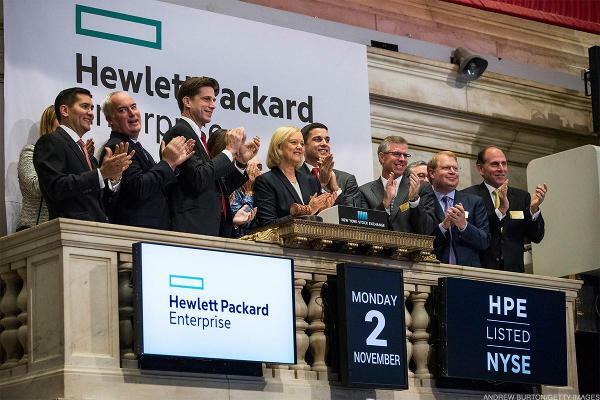 HPE's successful quarter helps stock pop 1.8% in pre-market trading. The types of switches that Amazon reportedly wants to sell to businesses have seen limited enterprise traction to date. However, recent tech trends could make them more popular. This new version of Dell is very different from the old Dell, and that's a good thing. These are the stories moving the markets Wednesday morning. The chipmaker's Epyc server CPU line continues to gain traction, as a new Cisco announcement shows. And going forward, Intel's manufacturing woes could help AMD add to its share gains. Amid growth in HP Inc.'s personal computer space, TheStreet's founder and Action Alerts PLUS Portfolio Manager Jim Cramer said there's a good read through to Micron Technology and Intel. In a talk with TheStreet, IBM Cloud Platform CTO Jason McGee argues the company has some unique strengths in a very competitive cloud infrastructure market. While many traditional enterprise IT giants are contending with weak hardware demand, things look much better for some of their chip and component suppliers. Though the IT giant beat estimates and hiked its earnings guidance, it did so with the help of several short-term factors. And its remarks about future growth are cautious. A growth-inspired confidence and key double sector breakout. Oh yeah. The networking giant's results should get a boost from good IT spending trends, software growth and a weak dollar. But telecom and cloud pressures could weigh. Many large businesses are now opting to shut down existing data centers and move their contents to public clouds. Amazon is well-positioned to grab a large portion of these deals. Markets closed near session highs Thursday.